Our website is responsive, so you can listen to us on your mobile too! Just head to camradio.co.uk and click on the play button at the top of the page. 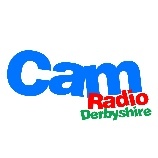 Alternatively you can find us on the TuneIn app, search for "CamRadio Derbyshire"
"Hey Google, Play CamRadio Derbyshire"